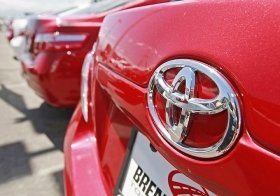 Edmunds.com estimates that in July, Toyota's incentives increased about $900 per vehicle to an average of $2,204, compared with $1,302 in July 2009. The estimate includes the cost of low-APR loans and subvented leases. WASHINGTON – A study partly funded by plaintiffs lawyers and presented at the invitation of the National Academy of Sciences says three Toyota models with electronic throttle control systems have had at least four times the rate of unintended acceleration complaints as the same models without the systems. The findings suggest anew the possibility of electronic safety defects, while Toyota Motor Corp. has said repeatedly that there is no evidence showing electronic throttles have caused unintended acceleration in its vehicles. The statistical study by consultant Randy Whitfield of Quality Control Systems was presented Monday to a National Academy of Sciences panel examining sudden acceleration in Toyota vehicles. The study found significant differences in the rates of consumer complaints to the National Highway Traffic Safety Administration for the Toyota Camry, Lexus ES 300 and Toyota Tacoma pickup from the 1998-2007 model years depending on whether the vehicles had electronic sensors or not. The rates were 5½ times as high for Camrys with electronic-throttle control systems as for those without, the 71-page presentation said, citing 2,001 complaints. The rates were 20 times as high for Lexus ES 300s with the electronic controls as for those without. And rates were four times as high for Tacomas with the systems as for those without. The Lexus ratio was based on 418 complaints; the Tacoma, 429. Whitfield acknowledged the likelihood that floor mat interference, sticky gas pedals, and driver error have played a role in some sudden acceleration accidents involving Toyota vehicles. But to the extent that those causes can't explain the disparity in complaint rates for the three models, “electronic control systems are certainly a reasonable explanation,” Whitfield, of Crownsville, Md., said in an e-mail. The Whitfield study sought to limit the impact that age might have on a vehicle's performance by including only complaints filed during the first calendar year after introduction of a model year. Toyota has said electronic defects have not played a role in any of the 93 sudden acceleration deaths reported by consumers to NHTSA or in the millions of vehicles recalled by the automaker since last November. Instead, Toyota has blamed problems such as floor mat interference and sticky gas pedals, as well as driver error. Toyota received some support when the federal agency used crash-data recorders, known as black boxes, to examine 58 crashes blamed on sudden acceleration. Brakes weren't applied by drivers in at least 35 of those crashes, and NHTSA said in August that it saw no evidence of electronics-related causes. But Toyota has acknowledged that the black-box tests by themselves have only limited value. NHTSA has asked the National Academy of Sciences and NASA to conduct in-depth studies of unintended acceleration. The science panel's report is due in June.